With the end of the contest coming in just two days I have been rushing but pacing myself to get this campaign finished (will be my first campaign that I will ACTUALLY have finished that has good detail sicne I had one hosted on BlizzPlanet (but mediocre one)) I am on my last map of which you actually control units in, then just two interludes and the end of my campaign! But I have actually another map but it is a Blizzard mission 8: The Big Push, where you see the Sons of Korhal begin to finally take their attention at a full throttle on Tarsonis. Legacy of a Warrior's Final Update! Okay I lied at the statement I said about having it completed today. I do have all the maps done but I have to spend a little time to do grammar/spelling checks and to do finishing testing to see if all the triggers work right. Then I'll post it all complete tomorrow. I also am adding a melee map of Grest's Capital/Reservoir since it is used so much in the campaign, so I decided to make a melee for people to battle on it their own special way. Last edited by Anonymous on Sun Mar 23, 2008 10:20 pm, edited 1 time in total. Legacy of a Warrior - Completed! Finally, after alot of hours working on this campaign, this here is completed Legacy of a Warrior, my first actual completed campaign. I am proud to of made this campaign! I hope you enjoy this. I jsut did test it but I was under pressure of time almost up so if you find any errors (especially with the countdown timer) I am sorry and please report them to me and I will fix them. I know announce my finished campaign Legacy of a Warrior is here! It is 16.7 MB and requires Brood War. Link is under text. Last edited by Anonymous on Mon Mar 24, 2008 8:15 pm, edited 1 time in total. 1) The terrain seems basic but rather natural. 2) Enough time to read the dialogs and is readable. 1) You neglected a LOT of things from typos to some fairly critical bugs. Many things could have been fixed if you paid more attention and did more testing (especially for the more-than-obvious bugs). However, I am an evil man and I like to make bug lists. I know I didn't catch everything. - In briefing, there was no "end transmission" or "press start" in the end thus I was wondering if there was more and waited. - Some earlier dialog wasn't "deleted" when the next dialog part shown up. - Have to manually move a marine to get Curtis Hollin instead of having automatically on your side. - Bonus marines and Curtis Hollin are the same brown color thus making hard to know which one is Curtis Hollin. - When the player finishes the last condition of the map, there is no pause nor invincibility thus Hollin could potencially get killed during his pre-victory speech. - Illogical : Curtis Hollin's suit was brown in Map #1 and somehow it is teal in Map #2 onwards? - Oddness : How Curtis Hollin did get goliaths when he was on the run from Map #1 and when he has still not fully returned to base in beginning of Map #2? - In briefing, it still stays at "The true terror has arrived ..." eternally and thus I wondered if there was more to the briefing. - CRITICAL : Have some "Unit Unplacable" BW errors when constantly spawning zerg units. - Illogical : When the enemy troops charge, the enemy 3-star general is left completely alone (tank unit) vs a wraith which would never happen in any kind of reality. - Illogical : No allied AI marines would just move and chill out in the middle of critical negotiations between two enemy sides. - CRITICAL : : The dropship already appears when it is supposed to only spawn 15 minutes later. - The dropshop should be disallowed to be built if the objective says you have to wait 15 minutes for one to take your hero away. - Could kill Adelia Melins during the negociations since you could move your troops and she wasn't invulnerable nor her troops. - Cannot control Justin Smith when you are supposed to. - White ghost is named Curtis Hollin when it is obviously not the case from the dialogs. Stopped playing for now at this point. Last edited by Ricky_Honejasi on Mon Mar 24, 2008 6:37 pm, edited 1 time in total. Wow, well I thank you for the constructive feedback, some of your points I thought I did change, such as when you attack Adelia Melins and to control Justin Smith. When you get to the white ghost which whom is named Curtis Hollin he is named that because when you get to the base (sorry after you kill Adelia Melins) he explains why. I'll change all that. Then the actions do create the dropship/beacon but I've done the other two timer stuff (at most, at least) still doesnt seem to do anyhting. Last edited by Anonymous on Mon Mar 24, 2008 6:52 pm, edited 1 time in total. Legacy of a Warrior v1.1! Okay, though I dont think this will count towards contest, I have fixed most of which Ricky had said. (I'm sure I got all the typos I could find), but did fix the critical problems especially. Here is an updated Legacy of a Warrior. Last edited by Anonymous on Mon Mar 24, 2008 8:13 pm, edited 1 time in total. That was good. You make some good-looking maps, I liked the idea of revisiting that reservation during the campaign. The terrain and story were good, and apart from some typos, I liked the dialogue. I, too, found the briefings somewhat confusing, since I didn't know if I should press start. You delivered a great story. I'd say, continue. Good job, especially for a first campaign. I would like to warn you about the bugs of the last maps though. -You have to change the trigger, or give us a warning. The objective is to build 5 depots, 2 barracks etc. and I don't remember that the player was warned not to build more of them. I have started building 6-7 depots and then the next trigger just didn't fire. Change the "player commands exactly x buildings" to "at least". -Nothing big, but there are several scout squad who just stay in one place while the others are "purifying" the planet. -In the desert part, after the minerals appeared I couldn't see anything. I heard that dropships arrived but you forgot to create map revealers. desert map is just a good closure. Imo it's unnecessary to continue after that. Thanks for the tip Revan especially on Map 7. I thought I did give you shared vision of player 1 in map 7. I'll fix that. Map 8, I know its from the original SC capaign, I decided to add that at the end to show how the Sons of Korhal now had to defeat the Confederacy since they used so much of their army to defeat the Confederates at the reservoir. But the Confederates at Tarsonis were preparing and Arcturus didn't have the patience, so he sends Duke to do the same thing at Grest, plant Psi-Emitters on the largest Tarsonian Orbital Platform. A few Psi-Emitters were stolen along with data on how to create more in a raid at the Jacobs Installation at Chau Sara under the order of Arcturus Mengsk. 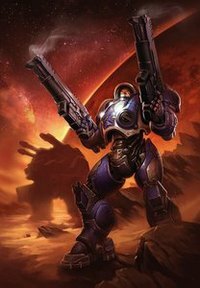 When they escaped, Mengsk had the Emitters re-aranged and enhanced the signal of the Ghost to reach farther and bring more Zerg. However, the Jacobs Installation is WAS in Mar Sara. I realized that in the missions 6: Revel in glory... and 7: May God Bless Thy The Fallen... , the text that appears in the briefing is the same. And other last thing. Sometimes (not just in this campaign, also in this post) you called the Sons of Korhal as the Dominion. However, if the events of this campaign taking place before the Starcraft mission The Big Push, this is impossible. The Dominion did not yet exist at this time. Anyway, I congratulate you. It is a great campaign, with good storyline, characters, terrain and triggers. Last edited by omega20 on Sat Apr 12, 2008 2:35 pm, edited 1 time in total. Thanks again, I'll work on changing all that. In the mission 5, What name has the white Confederate Commander (the false Curtis Hollin)?? In a emergency transmission, he is called himself as Simon Steers, but then he said that his true name is Xavier Valien. How long has it been? Three months, alot has changed since you've been gone, 'old friend'. THREE MONTHS?!?! Curtis has been three months in Artemis? Do the Zerg take three months to reach Grest? And other thing. In the missions 1 and 2, Curtis is brown, in the missions 3, 4, 5 and 6, is teal, and in the mission 7 is blue. What color is Curtis Hollin? Last edited by omega20 on Thu Apr 17, 2008 5:53 am, edited 1 time in total. Mission 1 and 2. He was brown to match his color he was in the interrogation which was the Private color. Then he is promoted which when you return to the reservoir in map 3 he is teal for Lieutenant (easier to put him out in selecting) Mission 7 I guess that was a goof on my behalf. I just forgot to change it to teal . I realized I may of made the battle on Artemis like only a couple days. But one it takes awhile to reach a planet when not warping to it, the battle must of took awhile. The Zerg at first had to reach the signal, the Zerg had to then warp in which they were probably doing some stuff getting ready to warp travel. Then to organize around the planet and attack. Plus I didnt include it took maybe a couple of days to assimilate Artemis as their Hive Cluster. Okay. Thanks for the information then. I will play the next version when it comes out.